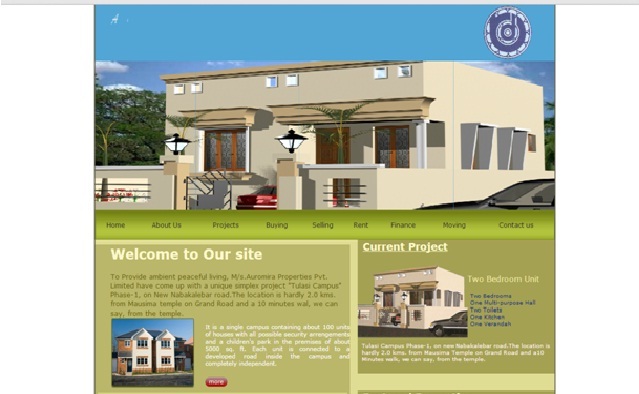 Auromira Properties is a leading real estate company in the temple city Bhubaneswar, Odisha. This company has many talented staffs with lots of experiences in real estate and infrastructure to provide affordable housing projects in the appropriate locations of the city. This company provides easy home loans for esteemed customers. This project is on Nabakalebar Road, Bhubaneswar, Odisha. This project is a distance of 2 kms from Mausima Temple, 5 kms from Kalpana Square, 10 kms from Rasulgarh, 2 kms from Police station and 2 kms from market complex. This project has various modern facilities like community hall, temple, atm, playground, 24 hrs electricity, water supply and security.